This hardtail Fat e-mountain bike's go-anywhere capability Schwalbe Jumbo Jim Evo 4inch wide tyres for even more traction. The hardtail FatSix model is the monster truck of the eBike world. Exploring new horizons was never this fun. With up to 75Nm torque, the Bosch motor delivers the turning power and acceleration required to boost you up the steepest climbs. The Bosch battery offers an impressive 30 mile range in the the most challenging conditions - that is a heavy rider, cycling hilly terrain, riding continuously in Turbo maximum-power mode. Bosch's new, more compact Purion handlebar mounted computer / remote control makes it easy to select support level (Off, Walk-Assist, Eco, Tour, Sport or Turbo). This backlit computer displays current speed, trip distance, odometer and, most crucially, range so you have an accurate gauge of how many more miles power assist you can expect at any moment, based on the battery's charge level. The drive unit and battery are so smoothly integrated with the hydroformed aluminium frame, many of the cyclists you pass won't even know you're enjoying up to 300% power assist. Gravity Cast Interface is a process borrowed from motocross bikes. Here, Haibike create a perfectly formed aluminium/zinc cradle purpose built for its Bosch crank-drive motor. Gravity Cast Interface ensures the motor is perfectly integrated with the frame with every bolt and bearing seat CNC milled for 100% accuracy. The motor is shielded from scratches, dings and the elements thanks to its bolt-on Skid Plate - another Haibike innovation. Crank Drive – the motor unit is mounted at bottom bracket level – the strongest, stiffest part of the frame. With its lower centre of gravity, a crank drive e-bike is more stable, the pedal assist feels more natural and the bike is better balanced than one with the motor mounted on the front or rear wheel. The RockShox Bluto RC Remote Lockout, air, Travel: 100mm. Schwalbe Jumbo Jim Evo tyres with a tyre width of 4 inches finding traction on rough & loose surfaces like gravel, snow or sand. For consistent, powerful, low maintenance braking, Haibike have matched a Magura MT5 (front) MT4 (rear) Hydraulic brakes. A Sram NX shifter controls the Sram NX, 11 speed rear mech over the cassette's 11-42 massive range of gears. An XLC dropper post makes it easy to raise or lower the saddle via the remote switch on the bars. The bars are extra wide (780mm) and extra burly (35mm centre) for assured control. 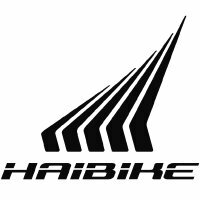 Why opt for a Haibike electric bike? It flattens hills, it beats headwinds, it takes the sweat and grind out of riding a bike, it helps you go faster and farther, and it has a much longer range at full power than first generation electric bikes. Haibike might be a new name over here but we can assure you that they are the leading manufacturers of e-mountain bikes in their native Germany - a country which has, more than any other, embraced the latest generation of truly trail-competent e-mountain bikes.